Hatters defender Luke Wilkinson praised skipper Steve McNulty for his impact since returning to the side. The club captain had been dropped to the bench for three games, but returned against Mansfield Town recently and has been a vital part of the defensive solidity since, with Luton conceding just once in three matches. Wilkinson said: “Macca’s come back in and been brilliant. He was disappointed to be out of the team but he’s carried on working, come back in, and like you’ve seen, he was absolutely brilliant. “The gaffer has gone out and brought two or three more centre halves in and if you’re not performing, I’m not saying Macca wasn’t performing, Macca found himself out of the team for whatever reason. 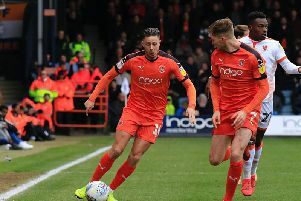 Hatters are looking far more secure than they have in recent weeks, as they kept Morecambe at arms length for long periods, to go with back to back shut outs at Kenilworth Road. Wilkinson continued: “We were conceding goals in the last minute, but it wasn’t just the goals, it was from errors, from myself and other players. “We’re just starting to get rid of the errors and I think we’re starting to see the results on the pitch. Wilkinson played his part in an attacking-sense too during the Globe Arena triumph, as he notched a third goal of the season from Paddy McCourt’s corner. Although the Shrimps levelled, further strikes from Cameron McGeehan and Jonathan Smith sealed the win as the defender added: “I think we started quite bright and it was nice to score another goal. I caught the flight of the ball quite early and glanced it in, so that’s pleasing. “It was disappointing to concede a goal, but two minutes later we went straight down the other end and Cam’s scored another goal. “Cam’s doing really well, he loves to attack and is always doing shooting after training. He works really hard and I’m glad it’s paying off for him as he’s a good lad and deserves it.